Friday flower event volunteers completed 30 bud vases filled with red, white and blue flowers for the Friday night Aleethia dinner for our wounded warriors. 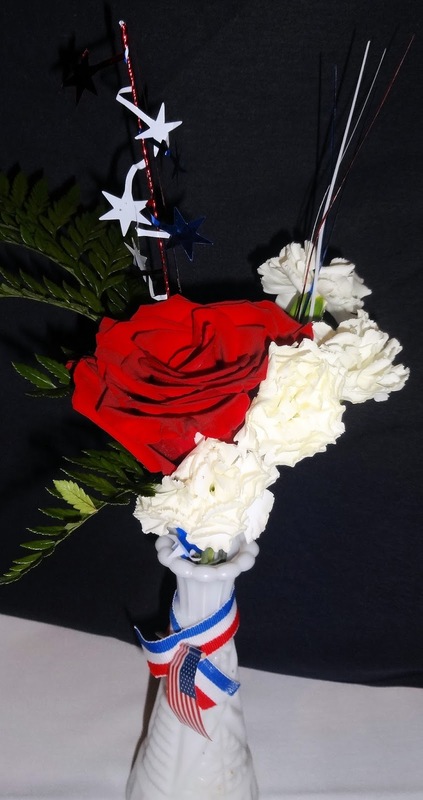 4th of July shiny decorations and American flags added a festive holiday look to the white vases. 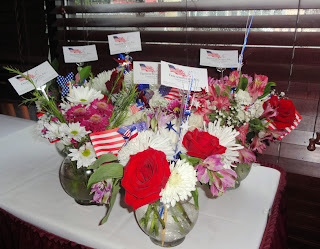 It was pouring down rain for the Aleethia dinner event at Tesoro's in Washington D.C. Freedom Petals had beautiful flowers to deliver to some well deserving people. As always, we have the best of luck when we are delivering, there was an undercover garage that connected to the restaurant so we stayed dry. It was a cozy setting, with long small tables and one round one. We arranged our bed vases on the tables and immediately the restaurant took on a pretty atmosphere with our flowers having the motif of red, white and blue to celebrate the 4th. 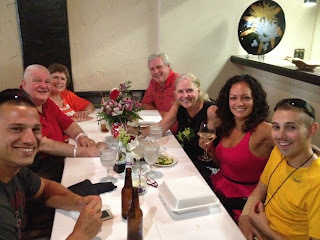 Michele and Barbara and their husbands stayed for dinner and we sat at a table with some great people. We enjoyed our conversation and learned that the couple sitting with us was engaged and getting married next August. We also learned from them that the visiting families are in need of the air mattresses so that they can be more comfortable in the hospital rooms with the wounded. 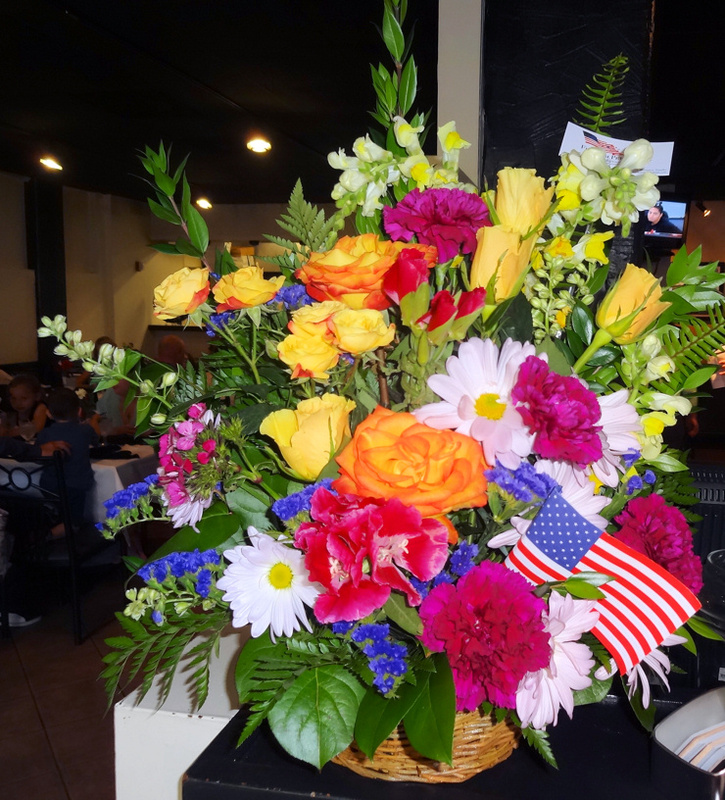 Michele stated that we would look into seeing if Freedom Petals could help with getting some donated. The evening ended with the rain stopping and everyone taking home our flowers...they were so thrilled to have such pretty flowers for the holidays. By Barbara K.
On Saturday, June 29th a handful of volunteers created beautiful flower arrangements and flower baskets for our hospital delivery on that Monday. It always amazes me how a few creative individuals can finish so many beautiful flower bouquets in such a short time. We always complete the goals we set. God loves our ministry! 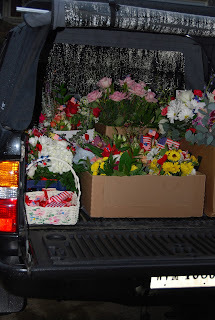 On Monday, a rainy day as usual for our deliveries, we set out with arrangements adorned with red, white and blue shiny sprays for our 4th of July event. All the decorations were donated by Melda a new volunteer. Thanks so much! We took beautiful baskets to the new coffee bar, just opening at the Wounded Warrior Cafe in building 62. They added a very festive touch. The hospital delivery was a success. We used larger vases this time therefore the spills were larger as well. By the time we were done the cart that held our flowers looked like a lake. Joan H. and I said we should take paper towels but we never remember that morning to bring anything besides our beautiful bouquets. Thanks to all who came to help, I know this is a busy time of the year and I appreciate the time everyone gives Freedom Petals to get the mission done. Next event will be the middle of September. Schedule to come.